I wrote yesterday about “the world’s demographic problem,” citing a new study about the fiscal implications of aging populations. The report was produced by the Organization for Economic Cooperation and Development, which is not my favorite international bureaucracy when they make policy recommendations, but I’ll be the first to admit that the bureaucrats produce some useful statistics and interesting reports. To be succinct, the basic message of the study is that developed nations (the U.S., Europe, Asia, etc) face a demographic nightmare of increased longevity and falling birthrates. It’s good that people are living longer, of course, and there’s nothing wrong with people choosing to have fewer kids. But since most governments maintain tax-and-transfer entitlement programs, the OECD report basically warns that those demographic changes have some very grim fiscal implications. In other words, the world’s demographic shift is actually a policy problem. The good news is that there’s a policy solution. The aforementioned OECD study (which can be accessed here) is a survey of how retirement income is provided in key nations. So in addition to grim information about fiscally unstable government-run retirement systems we looked at yesterday, the report also has data about the nations that rely – at least to some degree – on private savings. Let’s start with this helpful flowchart in the report. It illustrates that there are three approaches for the provision of retirement income. The first tier is government-run programs such as the U.S. Social Security system and the third tier is voluntary savings such as IRAs and 401(k)s in America. For today’s discussion, let’s focus on the second tier. These are the systems that are “funded” with mandatory savings. And I highlighted (in green) the two private options. 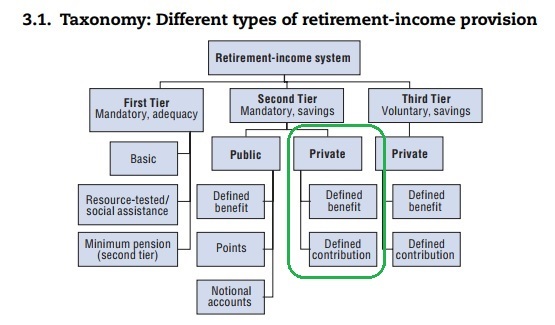 In a “defined contribution” system, retirement income is determined by how much is saved and how well it is invested. Workers accumulate a big nest egg and then choose how to spend the money when retired. In a “defined benefit” system, workers are promised a pre-determined level of retirement income and the managers of their pension funds are expected to ensure that enough money will be available. Yes, public options based on real savings do exist. And they presumably are better than the pay-as-you-go, tax-and-transfer schemes found in the first tier. But it’s also the case that these systems (such as pension funds for state and local bureaucrats) generally don’t work very well. 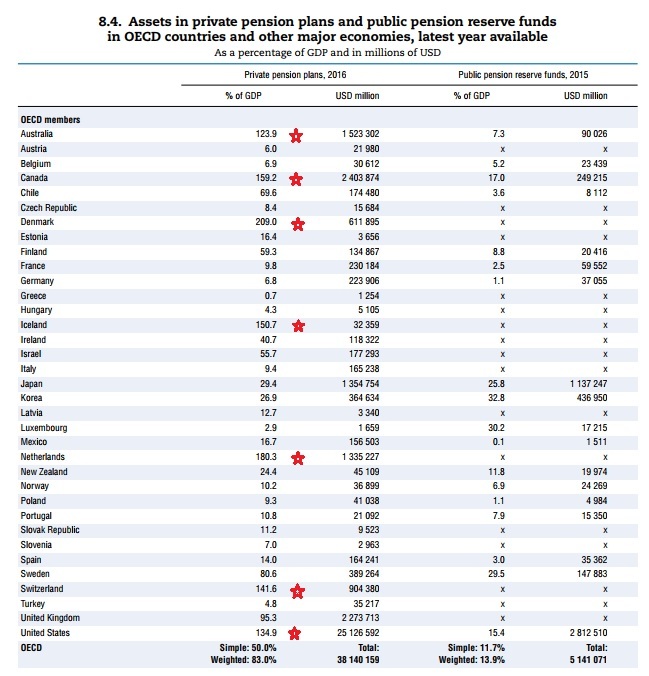 So now let’s look at another table from the OECD report. 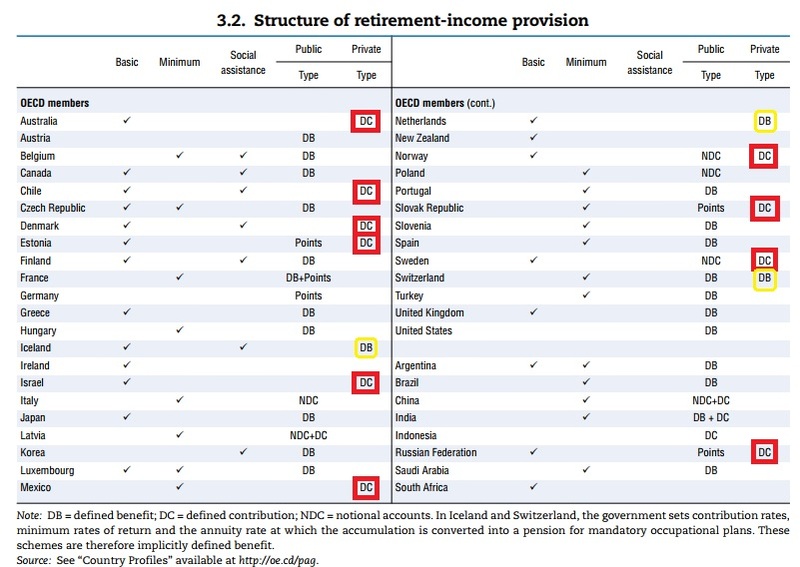 It shows nations that have some degree of mandatory private retirement savings, either defined contribution (highlighted in red) or defined benefit (highlighted in yellow). As you can see, there actually are a lot of “privatized” systems. I’ve actually written about many of these systems, especially the ones in Australia and Chile. And I have very recent columns on the Dutch and Swiss systems. A common theme in these columns is that government-run systems are very risky because workers are at the mercy of politicians, who are great at making extravagant promises. But huge unfunded liabilities show that they’re not very good at delivering on those promises. Nations with funded systems, by contrast, accumulate private savings. That’s not only good for workers, but it’s very beneficial for national economies. This table from the OECD report shows that Americans and Canadians have managed to save a lot of money, but all of the other nations with pension assets of more than 100 percent of GDP have mandatory funded systems. When I talk about how the United States would benefit by moving to a private retirement system, people sometimes say it sounds too good to be true. That’s obviously not the case since other nations have very successful private systems. But there is a catch, as I acknowledged in 2015. …a big challenge for real Social Security reform is the “transition cost” of financing promised benefits to current retirees and older workers when younger workers are allowed to shift their payroll taxes to personal accounts. Dealing with this challenge presumably means more borrowing over the next few decades. The appropriate analogy is that shifting to private retirement accounts for younger workers (while protecting current retirees and older workers) would be like refinancing a mortgage. The short-run costs might be higher, but that temporary burden is overwhelmed by the long-run savings. That’s a good deal, at least if the goal is fiscal stability and secure retirement. Or we can stay with the current approach and become another Greece. P.S. Social Security reform is especially beneficial for blacks and other minorities. P.P.S. There is some risk with personal retirement accounts. But I’m not talking about the implications of a falling stock market crash (even a horrible crash would be offset by decades of compounding earnings). Instead, I’m referring to the possibility that future politicians might simply confiscate the money. When people stop paying these “premiums”, the retired group will be fully vested in those programs. All others are partially vested or not at all vested. Since the normal person works 45 years for retirement benefits lasting ~15 years, for every three months until a partially vested’s current retirement date, that date would be moved back by one month. Therefore, the partially vested group would have three months to save for each month lost in benefits. As the reduction in Entitlement cost begins to accumulate, taxes would fall providing the source of future retirement savings.